I recently went to the local fish store to purchase a new aquarium, and after picking out an aquarium from the display setups, I was confronted with two problems. The first was the standing threat from my wife that if I bring any more fish tanks into our home, the police would never find my body. While I lend some credence to this threat, there’s a good chance she wasn’t completely serious. Probably. The second problem was a bit more surprising – the store didn’t carry any stock on-site. Obviously, this hasn’t always been the case, and just a few years ago I was able to indulge my aquarium addiction by just going into a store and picking up a new aquarium. Now it was almost like there was a waiting period. But this is becoming the norm among many big box stores, and a surprising number don’t keep any large stock on hand any longer. All in effort to compete with online stores – which is where I was going to have order my new aquarium from. This experience led to me wonder where the best place to buy an aquarium online was. While there are numerous retailers out there, not all of them are completely trustworthy. When I sat down and thought about it, most of my online orders go through only three retailers – retailers who provide both excellent prices, and an amazing selection. They also offer the peace of mind that comes with shopping from a well established store, and not buying from Joe’s Used Aquarium Emporium. When it comes to online shopping, Amazon is the 800 pound gorilla in the room. With its immense distribution network, and fast free shipping on most items, it’s the go to site for most people looking to buy almost anything online. 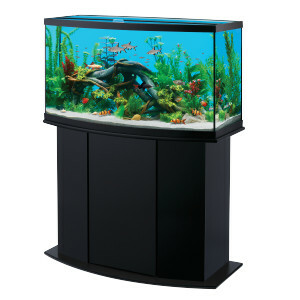 And this makes it a great place to buy aquariums online. Amazon offers a staggering array of aquariums, and while much of the inventory is concentrated among smaller fish tanks (1-30 gallons), they still have an excellent selection of large tanks for the serious enthusiast. One of the main benefits of shopping at Amazon is that they offer free shipping on most items, and they usually have the best prices. With that being said, there is the occasional item that is priced higher than at other stores – so always do your due diligence before purchasing. I have to admit that I love Big Al’s, and I’m a regular face at the store in my area. They have a great collection of exotic fish, and I can always find fish there that I can’t find anywhere else (especially, since it’s so hard to order fish in online in Canada). And while they’ve branched out to over 20 stores locations across Canada and the United States, the majority of their business is still done through mail order. And they excel at shipping pet supplies. Not only do they offer free shipping on many orders (assuming they’re not heavy weight, and meet the minimum purchase amount), but they are renowned for their excellent customer service and reliability. Big Al’s is great place to purchase aquariums, and they have an amazing selection of tanks. The tanks range from small betta bowls, to large tanks for more experienced aquarists. But odds are, you’ll find whatever it is you’re looking for here.